if I'm replanting wedelias, do i have to use new soil around the plant? I'm thinking you are referring to Wedelia trilobata aka creeping daisy aka yellow dots. You don't say if you are transplanting from pots or plants already in the ground, but either way you don't need new soil around the roots. These plants are VERY invasive, and once you plant them, you are just about guaranteed to always have them. So consider carefully where you want them. If they're in the ground just dig up a good sized rootball and transplant them. If planting from pots, gently turn the pot upside down in your palm and tease the plant out of the pot. yes, these are the wedelias that I'm talking about. you seem to be the most honest and knowledgeable gardener. the home depot guy told me to use pot soil, why, i don't know. fox nursery told me not to use compost but to use fertilizer, probably to make more money. anyways, this is where I'm at. these plants are going around a restaurant. in a front garden and a back garden which are isolated by concrete parking. so escaping is not an issue. I'm a bit worried that the periwinkles will attract bees around our drive through. and I'm guessing that the periwinkles are not as fool proof as wedelias. would blue rug junipers be more fool proof? maybe i should use wedelias in the back too? the home depot guy told me to water the garden a half hour every other day to help the roots grow. is this correct? i forgot to mention that i put mulch over the periwinkles. will the mulch hamper spreading? rruuunnn, I would say to water it enough in a slow watering to reach further down then where the roots are, not sure what zone/state you are in or the kind of soil you have,but if you are planting now you are in a better zone then I.We are pretty much frozen here in Mi.Zone 5-6 (depends on who you ask) . According to my periwinkle, I do not water at all (besides the first planting which I will water several times after it goes into the ground) I just let the rain (whenever it comes down) water mine. Now there are various varieties of periwinkle and I'm not certain if the one you wanted to plant is the same as the ones I have. As far as bees, I don't have that problem, then again I live here in Mi and my garden has lots of other plants that bees would feed off of during the season, besides,mine flower for a very short period of time, the main feature is the green foliage. As far as mulch, it would depend on the amount (thickness) the kind and how you water along with temps and sun direction. Mine do fine, they tack themselves to the mulch (untreated wood chips) and continue to grow.Depending on which variety you have..you may have to monitor its growth, within 2 years or so with 2 small cuttings you can have a nice filled in area within 5-6 years you will be ripping it out and it can be tough,so just watching will be your preventative.They are a nice plant and the first butterflies we get here like them. Are these vine in part shade? the periwinkles are under a tree behind the building. so they are somewhat shady. I'm really thinking about converting to junipers. I have not grown them. Rruuunnn, thanks for the compliment. You make me blush! I try and share all the info I either know or can research. I have never grown wedelias so all my info is from what I've researched and know about certain types of plants in general. I don't remember where you live, but I'm thinking it was a warm zone, perhaps California and zone 9? Anyway, I'll still try and help you. Some good advice from Kale. Junipers want full sun of 6 hours or more, so they won't do well in a shady spot. If the mulch is covering the plant or pressing against the stems where they come out of the ground, it can cause them to rot or smother them. The mulch should be under the stem aka vine of the plant, and just up to the stems where they come out of the ground. Here's some pics. In this first one the periwinkle has grown through the mulch and sits on top of the mulch. 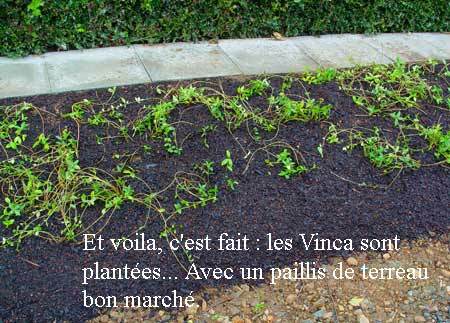 Here's newly planted and mulched vinca - aka periwinkle. It will take about a year or two to fill in. As for the bees, they will be attracted to it but bees tend to be too busy to bother people unless they are stepped on or otherwise harassed. I would think the wedelias would attract bees too. Flowers that are tightly doubled blooms are less attractive to bees as they can't easily get to the pollen. Here's a mum that has petals covering the pollen. This one has the pollen exposed and easy to get to. Without knowing your hardiness zone it's difficult to make recommendations, but you might want to consider plants with colorful leaves instead of flowers if you don't want to attract bees. Caladiums grow in shade and come to mind but they are only hardy in zone 10 and warmer, so you would need to lift the corms for the winter and replant in spring. Croton is another plant with colorful leaves that can grow well in shade but is also tropical in nature. If you add your hardiness zone and state to your location in your profile it would be most helpful. the home depot guy told me to use pot soil, why, I don't know. Maybe he said that because he thought you were planting in containers and the potting soil allows for better drainage. fox nursery told me not to use compost but to use fertilizer, probably to make more money. anyways, this is where I'm at. I don't think so as you would probably spend more for the quantity of compost. Again, I'm not all that familiar with wedelia and the sites I gave you should help with what type of soil they prefer. If the fertilizer was recommended for the periwinkle then I would suggest you use an organic fertilizer. If you are planting under a tree, anything you add to the soil will effect the tree. Compost and organic fertilizers are gentle in the way nutrients are relaeased so it's great where ever you use it. Synthetic fertilizers will cause a flush of growth that tends to attract insect pests and can leave behind residual salts over time and that's not good for trees. Without knowing your weather it sounds a bit too often, but do be careful with overwatering your tree. Water when the top inch or two of soil dries until the plants are established. Just stick your finger into the soil under the mulch. Up to your first knuckle would be 1" and the second knuckle would be 2". how long will it take for mulch to become compost. can i speed the process with something. this is the mulch that I'm using. am i using the wrong type of mulch with my periwinkles? You've got the right kind of mulch. I use a shredded mulch as well. I prefer it to chips or chunks, especially for flower beds and perennials. The chips seem to work well with shrubs too. It's difficult to say exactly how long it will take to degrade. It won't exactly become compost as it's shredded wood and therefore considered a 'brown' aka carbon based. You would need a mix with 'greens' aka nitrogen based to become compost. Much will depend on your climate and how much water it gets. Turning it and keeping it slightly moist will help it to degrade, but I'm not sure why you would want to do that. Mulch can get expensive and then there's the labor to apply it. i think my mulch is chips, not shredded? It looks like either chunk or a mix of sizes. i just noticed that it says fine to medium texture. I'm just gonna leave them. and when the periwinkles spread, i'll pull the mulch aside. is that okay.